Having a successful backyard getaway requires a lot of time and energy. To save your time and make it less stressful there are some small yet very helpful tips. Below we will discuss 10 tips which are going to make your backyard party the ultimate fun one. A party without a proper checklist and a checklist is quite different. Rather than jumping to arrange different things and to do a lot of work make a proper list. Take enough take and think about every aspect. Don’t make this mistake that you have all noted in your mind. Without a list, you are going to miss something anyhow. Therefore, start your backyard party planning with a proper list. The first thing people going to notice at your party is how well you have prepared for the seating arrangements. Always keep some extra chairs than required. If you don’t have extra then you can easily rent them or even you can borrow it from someone. If possible try to decorate the chairs, tools or cushions. It is not necessary it will just increase the beauty. As you are going to set your party in your backyard it is full of your responsibility that you make the place fully ready. Check whether you need to do any shredding or is the ground leveled or not. Check the drainage system if you are going to hold the party in a rainy season. Make sure the place is ready and safe for your getaway. We cannot emphasize more on this point. You don’t want to ruin your party with a sudden rain, or strong winds, right? If it is a sunny day even then you need to take preparation according to that. To avoid any sudden change of the weather it is always best to plan your party with a gazebo and canopy. Proper canopy system will make your backward party protected thus more enjoyable. Bugs, mosquitoes can take all the attention of your party if haven’t taken enough preparation for that. Actually, this is even worse than weather change. Therefore, spray bug sprays all over the place just before the day of your party. Place some fan near the seating places and also put some citronella candles. Mainly take all the necessary steps to keep the bugs away. An integral part of any kind of party is the foods and the drinks. Before making any food arrangements think whether it is going to be catered or a buffet style? What are the items you are going to serve? Do you need a separate caterer or you will do all by yourself? For each scenario, you need different types of preparations. If you are going to a large party and booked a caterer, then make sure there is enough accessibility for the caterer to the party. Don’t only use lights for decorating purpose. 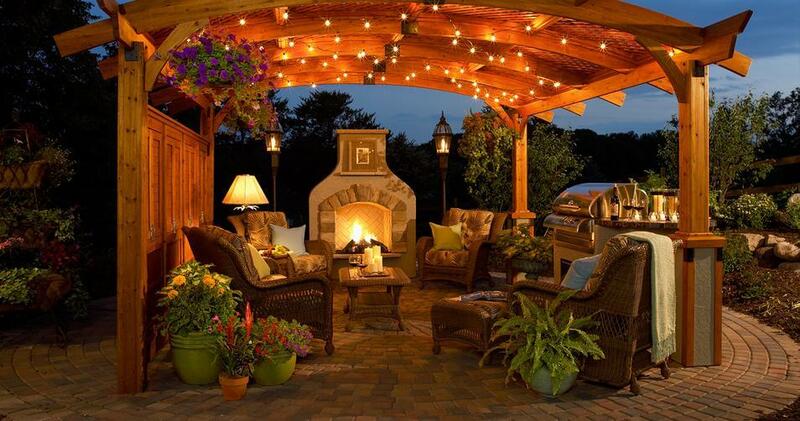 Different types of lights can make your place really nice and magical. However, at the same time, you have to remember that the lighting needs to be perfect when the sunlight is not there. If you have only decorative lights then the guest might have a problem to look around the place. While setting up the lights look out for the cords. There is no party without proper music. Whether you are going to play loud music or soft music, you have to set the music system before the party starts. Place the speaker at each corner of your backyard. Don’t set the speaker too close to the seating places, as nobody wants to sit just beside the speakers. Waste management is as important as food arrangements or seating arrangement. Make sure you have enough room and arrangements where you can keep the waste. Try to place multiple bins all around the place so that guests can also easily use them. Maintaining hygiene needs to be your priority. Play music, make arrangement for a dance floor, try different fun activities or just gossip with your guests. Try to keep them as engaged as possible. Keep serving them chilled drinks, bears or small food items before the main course. Make some separate playing arrangements if there are children in the party. Just remember you cannot make your guests feel uncomfortable or boring. However, don’t overdo. Keep it simple and refreshing. So, these are some of the planning tips which is going to assist you to have the best backyard getaway. Now, these are not the only things, but these are some basic tips that you cannot just miss. Don’t panic, just take your time and you will have a great time with your close ones for sure.